Nureva — Where should I install the microphone and speaker bar? Where should I install the microphone and speaker bar? The checklist below offers some points to consider when installing your HDL300 integrated microphone and speaker bar for the HDL300 system. The HDL300 will work from any wall so long as the space meets the recommended size requirements. 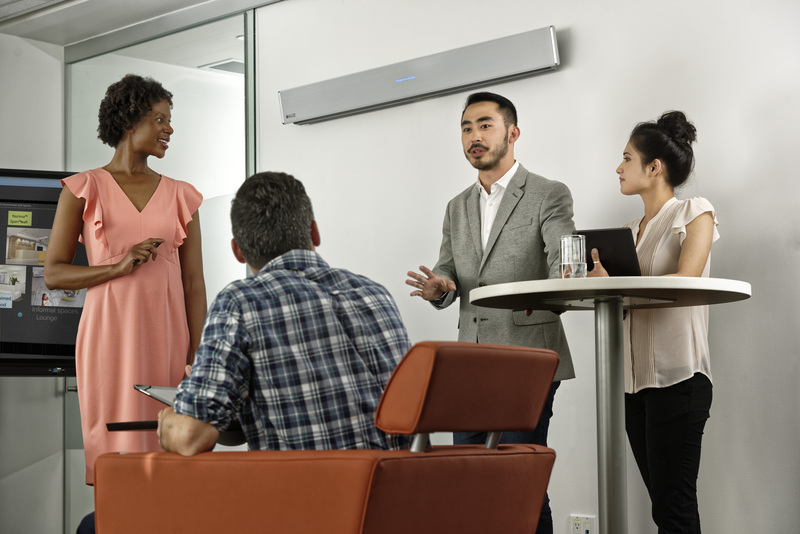 Microphone Mist™ technology is designed to pick up clear audio as people move around the room. Therefore, people who are talking can turn their back to the HDL300, and the sound will not be affected. This technology gives you the freedom to install the microphone and speaker bar on any wall in the room. Although there are only two choices, the color of the microphone and speaker bar can be a big decision. As most wall colors are light, a white microphone and speaker bar may blend into the room better. Given that you have the freedom to install the microphone and speaker bar on any wall in the room, you can install it where it will be least noticeable. However, if you have dark walls or would rather the microphone and speaker bar match existing equipment, like a flat-panel display, black might be the choice for you. The single HDL300 system can cover a room that is up to 30' x 30'. If your room is larger, you will need to install a Dual HDL300 system, which works for spaces up to 30' x 50'. For a list of technical recommendations, see our Installation requirements and recommendations. Can I use other devices for audio when the HDL300 is connected? Can I use a USB extender with the system?